In the beginning of 2017 millions of CIA documents were declassified and uploaded to an online database. There are some pretty weird ones. In January of 2017, the CIA declassified 12 million pages worth of documents and uploaded them to an online database. It was only a matter of time before people searching the database to find interesting, weird, and sometimes just funny crap. These CIA documents give a small idea of what life was like at the organization over the last 60 years. The documents date back to the 1940s and up until recently, those documents only lived on four computer workstations in a room in Washington D.C. The CIA Records Search Tool, known as the CREST database, contains everything from the mundane to globally significant topics. The following are ten of the strangest and weirdest documents found by inverse.com after searching through the database. Some of these documents are mysterious in the fact that they were classified at all. So the CIA isn’t necessarily all business – they do have a sense of humor. While the jokes may not seem funny today, they were probably hilarious at the time. Given the depth and seriousness around the Cold War, it’s not surprising that some comic relief was commonly needed. It would have been a welcome break from the doom and gloom of a potential nuclear winter. 3. “Are you a self-conscious human being or a programmed slave? 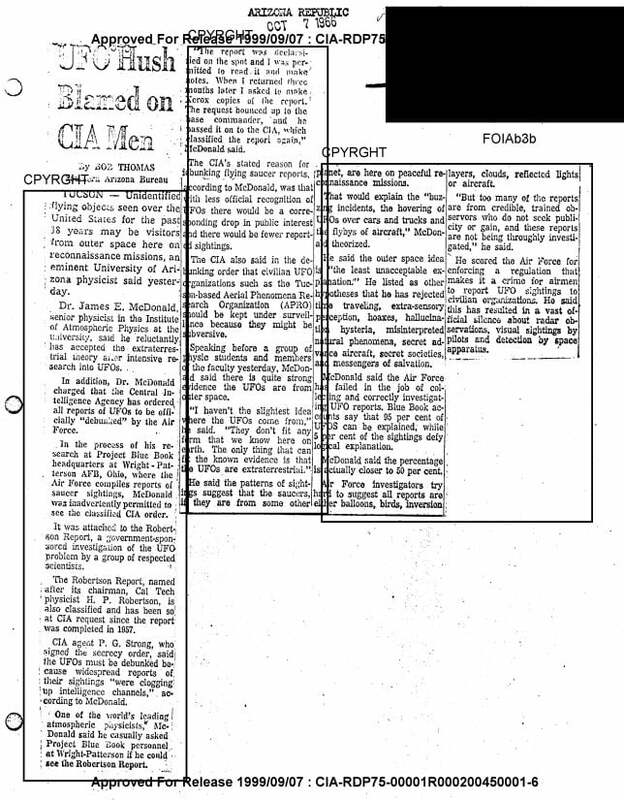 The document claimed that the CIA was intent on turning a population into “Zombie-like slaves”. In 1973, two men attempted to perform a psychic probe of Jupiter. Their attempts were performed separately but simultaneously so they could compare independent psychic results and determine how close they would come to reality. NASA’s Pioneer 10 module would be soon passing Jupiter to confirm (or deny) their abilities. This document, titled “‘Magician’ walks into the laboratory,” is a translated document about a “magician” who can create windows into unknown worlds in Tbilisi, Georgia. The document also extensively describes the technique of Kirlian photography. Maybe the move Men in Black had it right. There was a scene in which Agent K picks up a tabloid magazine at a news stand and calls it, “some of the best investigative reporting on the planet”. 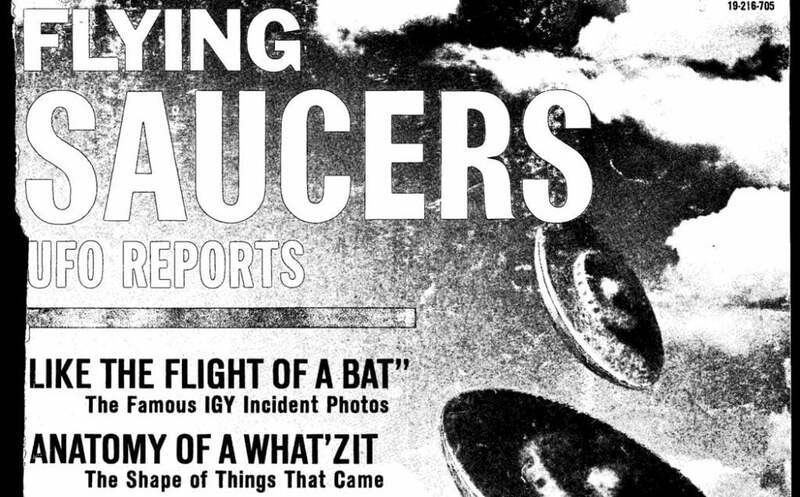 The CIA felt the need to put this cheap tabloid magazine right into its classified archives. That usually only happens if the item contains some information which is actually, truly classified. Pretty crazy huh? This little gem kinda speaks for itself. The biophysics of parapsychology? Electrostatics of telekinesis? Just like the CIA, the Soviets didn’t take any options off the table no matter how far-fetched they may seem by today’s standards. 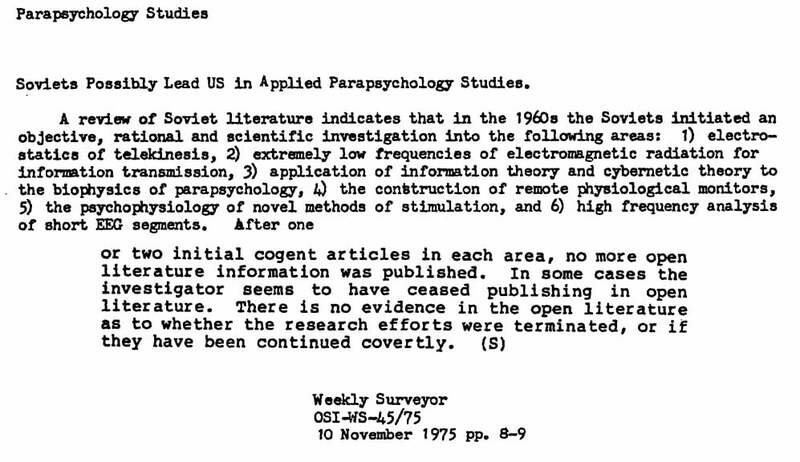 What’s sorta creepy is that last line stating, “There is no evidence in the open literature as to whether the research efforts were terminated, or if they have been continued covertly.” Maybe the Soviets made breakthroughs and we never found out about it? It also notes that Americans supposedly stole Nazi gold in 1945. By far my favorite document. Apparently, the Coca-Cola delivery man complained about missing bottles. While this type of communication today would likely take the form of an email blast to all employees, back in 1954 this would have been a letter posted on a community board. How Did These Become Classified? While some of these documents may have been clearly justified for classification, others had seemingly mundane information. It’s not uncommon for these types of documents to become classified material. All it takes is one word or phrase that is classified for the entire document to be marked. 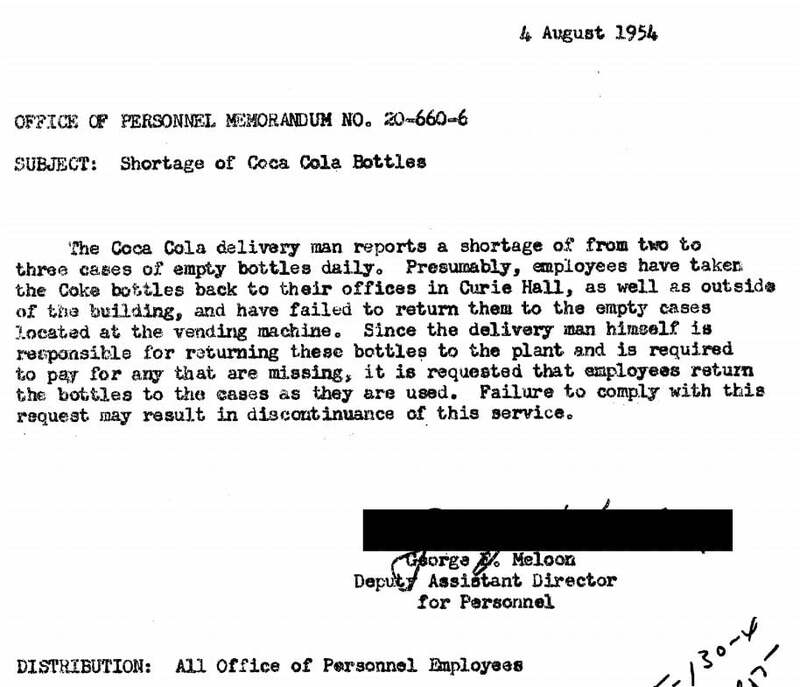 The Coca-Cola bottle shortage in and of itself may not have been classified, but perhaps the fact that employee offices were located in Curie Hall may have been. The knowledge that a likely uncleared delivery man had access to a classified area may have also been enough. Previous The Fermi Paradox – Where is Everybody? Next Bohemian Grove: New World Order or Just Rich Dudes Looking for Privacy?